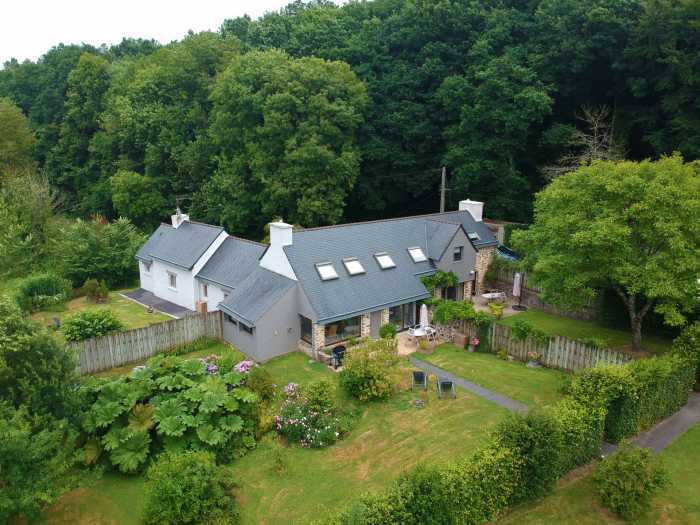 Properties for sale in Brittany, France - AHIB-3-DN-658 Morlaix 29600 Gite complex... main house + 3 gites on 12442m2 - WOW! AHIB-3-DN-658 Morlaix 29600 Gite complex... main house + 3 gites on 12442m2 - WOW! In a clearing surrounded by woodland and on the site of an old water mill is this gite complex offering a main house and 3 gites and surrounded by 3 acres of private grounds. The main house was designed by an architect so that it would be in harmony with the woodland surrounding it. Built in 2005 it offers on the ground floor, a large open plan split level living room with fitted kitchen open onto the dining area with an interesting inside garden, on the lower level is the lounge with a mezzanine and large bay windows out onto the patio area. Then the is the master bedroom with ensuite shower room, as well as a cloak room, small study and a utility room. Upstairs you two bedrooms with mezzanine sleeping platforms, a third bedroom, a shower room and WC. The old mill has been fully renovated and offers a large covered terrace area, lounge, fitted kitchen, shower room, toilet and 3 bedrooms. The second gîte offers an open plan lounge/kitchen with fireplace, a laundry room and WC, then upstairs are two bedrooms and a shower room. The third gite has a similar open plan kitchen/lounge, a shower room, mezzanine and one bedroom. The property is accessed by a private lane and is fully enclosed. You will also find two 3 car carports, a large stream fed pond, as well as a large wooden barn. If you are looking for a rural retreat away from all the hassle and bustle, but at the same time close to a large town and transport facilities, then this might be it! Whirlpool tub, Fireplace, Double glazing, Sliding windows, Internet. Airport. Highway. Town centre, Movies. Shops, Primary school, Middle school. Train station, TGV station. Golf. Hospital/clinic, Doctor, Sea. Beach, On main road. Supermarket.